Black Friday is one of the biggest shopping days of the year, and it’s a great opportunity to score some deep discounts. But it’s also an opportunity for retailers to separate you from your money — and by and large, they succeed. 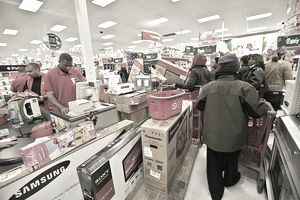 Research firm ShopperTrak predicts that Black Friday will be the busiest shopping day of the year, the National Retail Federation predicts that 115 million people will shop on the big day (and 32 million people will get a head start and shop on Thanksgiving). With all those consumers eager to shop, retailers are going into Black Friday with an array of strategies designed to make you spend. Between crafty wording and artificially limited supplies, it can be hard to tell which doorbusters (and other sale items) are truly deals — and which are busts. So you need to have a strategy of your own. Whether you’re planning to shop from the couch or in the stores, here’s how to make sure your dollars are grabbing you the best deals. Before you buy, use price-comparison services sites like PriceGrabber.com and tools like PriceBlink (a free browser add-on and app that searches the for better prices, coupon codes and free shipping offers). Then head to deal sites including Offers.com, BradsDeals.com and BestBlackFriday.com, which aggregate (and rate) all of the Black Friday and holiday shopping deals for you. According to Offers.com CEO Howard Schaffer, you can expect most circulars to be fully leaked the week of Thanksgiving. In the meantime, however, use last year’s ads (which you can find online) for preparation. History tends to repeat itself, especially when it comes to Black Friday. Is it worth dragging yourself out of bed (or away from the Thanksgiving table) just to land a doorbuster or two? Not so fast, say experts. “It’s a game the retailers are playing,” says Schaffer. “They’re just trying to get you there.” And once you’re there, they want to upsell by getting you to more items in your cart — and more expensive ones, at that. Be wary. Doorbusters are often third-tier brands that are cheaper in price and quality, not built to last and bound to disappoint, says Schaffer. So, if you’ve never heard of a brand, skip it. TVs are always among the hottest doorbusters, so they merit specific advice says Lehmann. She explains that many are “Black-Friday-specific” models, which could mean a popular name brand but with fewer features (like less memory, fewer HDMI inputs, for instance). It could also mean that the model was made specifically to be sold at a discount around the holidays. To weed them out, check model numbers. “The better ads will list them, and from there you can compare to the same brand TV with the same specs to spot the specially manufactured stuff,” she says. Another red flag is if the store is selling something it usually wouldn’t (for instance, a store that doesn’t sell TVs selling a TV doorbuster on Black Friday). So what’s worth going in for? For starters, keep an eye out for specific products, especially those “hot” toys or devices — for instance, this year’s Fingerlings. Manufacturers and retailers will purposely under stock the hot-selling items to encourage you to act quickly. And while many of the same deals will be online, some ads will denote “in-store only” (Schaffer says Wal-Mart, Best Buy, Target and Kohl's are consistent with this strategy). Others might read “limited quantities,” which could mean it won’t be available online, says Lehmann, who explains that “stores are often losing money on these, so the incentive to keep a deep inventory on them is very low. Are quantities limited? Are there limits on how many a customer can buy? Will they give you a rain check if they sell out? Is it only going to be available for that price all day or just the first hour of the sale? Can coupons and other offers be applied? Then, if you go for it, make your purchase on a credit card rather than cash. (That, by the way, is a good idea for any large electronics — your credit card can provide extra warranty protections.) And if the deal comes with the caveat of no returns, then think twice — the freedom to return an item your recipient doesn’t like is often worth it. Finally, remember that no deal is worth it if it costs you money you don’t have. So before you do any shopping this holiday season, take the time to create a gift-buying budget, and break it down into how much you plan to spend on each person. Then, be disciplined. If Aunt Mary’s immersion blender costs $5 more than you’d allocated, buy Uncle John a cheaper shirt to make up the difference.